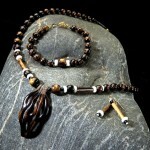 This piece is my one design using a clasp that is more than just a fastener. It caught my attention, I suppose, because of the way it depicted 3D flowers. I have always enjoyed flowers but had never designed flower beds and chosen the plants that would bloom there. Since moving to Georgia, I have had that opportunity and have reveled in it. 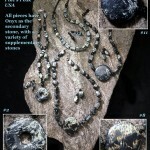 Anyone with enough money can have three strands of perfectly matched graduated round Pearls. My object in this piece was to have the pearls increase in size and roundness as the strands progressed toward the center from the clasp, to explore variation in Pearls but compose them into a unified piece. As you will note, some are baroque and others approach perfectly spherical. All are natural, not cultured, and get their varying colors from the minerals that occurred where each oyster grew. 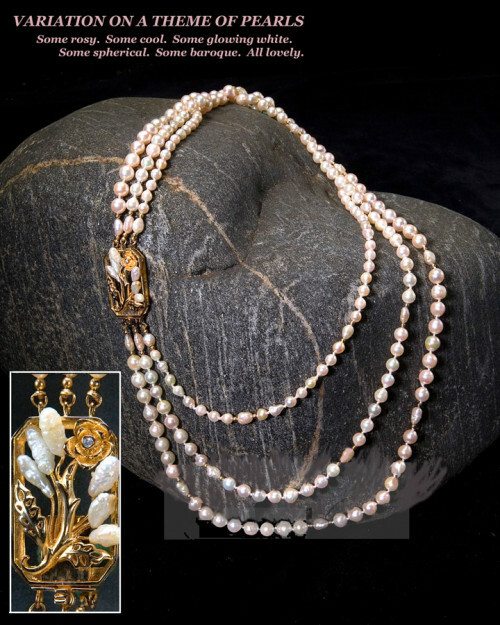 I used freshwater rice pearls as accents to tie in with the “flowers” in the Vermeil clasp, and tiny 14K goldfilled beads to echo the color of the clasp. 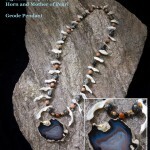 These accents line up when the necklace is worn with the clasp in the back of the neck. This is a beautiful pearl necklace but I love the clasp. 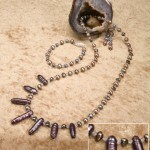 It is a fashion treat to wear pearls with this added artistic feature. She has such an eye for beauty……….